As renewable technology costs have plummeted in recent years, excitement about the off-grid renewable energy sector has exploded. Yet there are still some significant finance barriers to overcome. A growing number of innovative enterprises and NGOs have developed solutions to reach the 1.2 billion people who do not have electricity, through solar lanterns, solar home systems and mini-grids. But while millions of energy-poor households have benefited to date, significant barriers exist to attract enough of the right sort of investment to bring electricity to the poorest of poor households and communities. 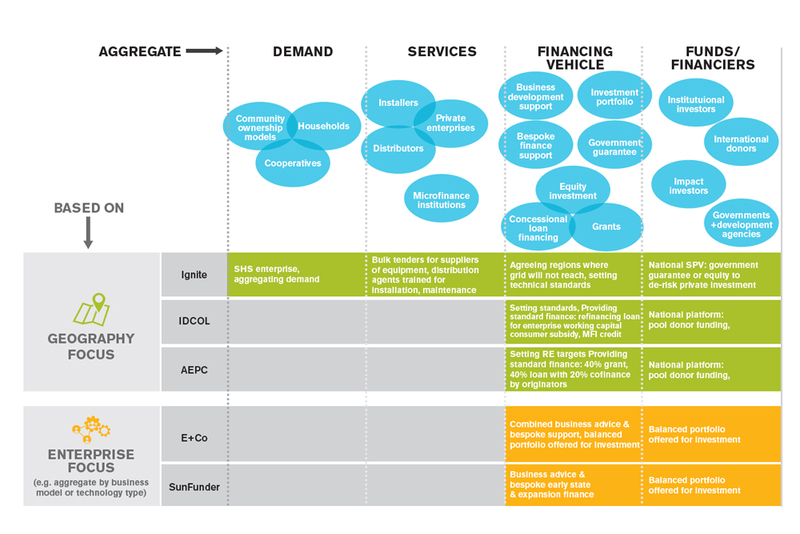 Investing in this sector has the particular challenge of matching the type and scale of finance offered by investors with the finance needs of small-scale energy access solutions. This challenge is amplified by the fact that countries with the greatest number of households without energy access are typically ones that have weak policy and regulatory environments; energy-poor consumers usually have no formal credit history, and the enterprises offering energy services have limited track records. To date, 70 per cent of solar lantern sales have occurred in five East African countries and India, representing only 35 per cent of the global off-grid population. Even in these top-performing countries, expansion is concentrated in better-off and more densely populated regions. In response to this challenge, innovative forms of ‘financial aggregation’ are emerging. These bundle together energy opportunities to lower transaction costs and make risks clearer to reassure investors, so reducing the cost of capital. This aggregation is critical to the rapid scaling up of investment into those countries with greatest energy needs, and is being called for under the Least Developed Countries Renewable Energy and Energy Efficiency Initiative (LDC REEEI) and the Africa Renewable Energy Initiative (AREI). Aggregation is the pooling together of finance, track record information, the demand from energy-poor consumers and the enterprises and projects providing energy services, into a bundle “to reach a scale where [the investment opportunities] become attractive to large investors“. Aggregating information: where an aggregator brokers finance for energy enterprises, through standardising the risk return information that enterprises provide to investors. It is still an early-stage market and the aggregators are tackling a range of market challenges while also building the pipeline for investment. As pioneers, each has its own challenges and is testing possible solutions. Learning from this experience will help inform initiatives such as AREI and LDC REEEI, as well as donor and private investor responses to these initiatives. The value of hand-holding: it is vital to support early-stage entrepreneurs to build the investment pipeline, as expanding the number of businesses is a prerequisite for achieving scale. Stimulating the market: shared platforms between governments, donors, enterprises, NGOs and aggregators have helped tackle policy and regulatory barriers to the market. Governments can increase certainty for investors by integrating decentralised energy into their energy planning. Long-term commercial sustainability: investors need to incentivise market activation, not just market expansion through new connections, through measuring the potential for future returns. This could include indicators such as the retention of customers, management of defaults and average return per user. Bespoke support enables innovation: even the most mature businesses in the market are still relatively young, creating continuing need for bespoke, flexible and adaptable support. And while standardisation is a key element of aggregation, reducing costs and increasing assurance to all parties, aggregation models also need to be flexible enough to encourage innovation and evolve with the changing market. Structuring aggregation: aggregation models operate at different points in the value chain and they have different strengths as a result. Understanding these design choices should improve the design of aggregators so they are clearer on the fundamental model by which they will operate their business, and where they should partner with other organisations. Countries with the greatest number of households without energy access are typically ones that have weak policy and regulatory environments; energy-poor consumers usually have no formal credit history, and the enterprises offering energy services have limited track records. A key element is deciding where they can standardise to achieve scale and reduce costs, and where they can offer bespoke support to help grow renewable energy enterprises. Exploring further innovation in how aggregators are structured is likely to have value – where, for instance, donors support advice to businesses behind investor platforms and underwrite expansion finance. At the very core of the challenge is for aggregators to structure investment so they reward enterprises that offer strong customer care, driving word-of-mouth referrals; that expand products to meet consumer demand, and that enable increasing productive use of energy by their customers. Clare Shakya is Director, Climate Change at IIED, and Rebecca Byrnes is a legal research and communications consultant. This post is republished from the IIED blog.